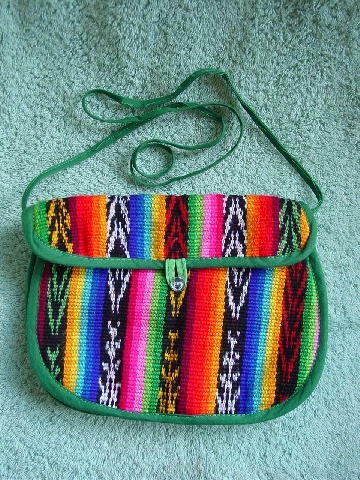 This handcrafted fabric purse has a green 38 1/2" thin fabric shoulder strap. The exterior fabric has a padding behind it. the interior has a green lining with a center zippered pocket and an open compartment on either side of it. The exterior vertical line designs are in purple, pink, red, orange, brown, yellow, and various shades of blue and green. There is a flap closure with a light green fabric loop and a clear button closure. You can tuck the strap in and carry it as a clutch. It's from a stylist's inventory, and was used for pictures for a model's portfolio.